‘Salem’s Lot tells the story of Ben Mears, a writer who returns to the small town in Maine where he lived between the ages of 9 and 13, Jerusalem’s Lot. The town has haunted his dreams for the past twenty years – particularly the Marsten House, an abandoned mansion with a horrific past. Ben’s return to ‘Salem’s Lot coincides with the reoccupation of the Marsten House: two strangers from Europe, Mr Starker and Mr Barlow, intend to restore it and to open an upmarket antique furniture shop. But soon after their arrival, strange things begin to happen – things which might not mean much on their own, but which put together suggest a very disturbing possibility. ‘Salem’s Lot is, as King himself puts it, a tribute to and a reworking of Dracula — the constant nods to Stoker are sure to make fans of classic horror smile. It says a lot about King’s storytelling skills that I enjoyed this novel as much as I did even though I have more or less reached a point of cultural saturation with vampires. But ‘Salem’s Lot is as much a small town novel as it is a vampire novel, and that was the aspect of it that interested me the most. It’s a story about secrets, silences, and intertwined lives in a dying community; a story in which the supernatural is not so much a new threat as it as a catalyser that causes previously existing hostile undercurrents to surface. My edition of the novel includes an introduction in which King explains that he intended to turn the optimism of Dracula on its head: he points out that Stoker’s story is one in which we know all along that progress will triumph against darkness, even if at some cost. But in the present day (or the present day in the early 1970’s; it’s interesting to think that this novel is nearly 40 years old), our faith in progress has let us down – or has it? When I sat down to write my version of the story in 1972 - a version whose life-force was drawn more from the nervous jokey Jewish-American mythos of William Gaines and Al Feldstein than from Romanian folk-tales - I saw a different world, one where all of the gadgets Stoker must have regarded with such hopeful wonder had begun to seem sinister and downright dangerous. Mine was the world that has begun to choke on its own effluent, that had hooked itself through the bag on diminishing energy resources, and had to deal not only with nuclear weapons but nuclear proliferation (big-time terrorism was, thankfully, at the time still over the horizon). I saw myself and my society at the other end of the technological rainbow, and set out to write a book that would reflect that glum idea. However, he goes on to say that his characters surprised him; that in the end ‘Salem’s Lot turned out to be far less cynical than he had anticipated. I’m glad this was the case, as I enjoyed the tenuous hopefulness that emerges at the end more than I think I’d have enjoyed the completely pessimistic novel he envisioned. But nevertheless, it’s easy to see that a sense of overwhelming darkness, of powerlessness, of being surrounded by forces beyond our control was his point of departure. As I was saying, ‘Salem’s Lot is very much a small town story: Barlow and Starker’s arrival brings out the worst in the community, and many of the horrible things that happen are only exacerbations of what was already there. King certainly doesn’t shy away from showing us his characters at their very worst. ‘Salem’s Lot has a very large cast of characters, and as a result most are drawn in broad strokes. This approach is very much intentional, as King is going for small town types rather than individuals, but I think I’d have been happier if a wider, less stereotypical spectrum of human behaviour had been portrayed. There were also times when I wished King had been kinder to his characters, if only because the authors I love the most usually are. By this I don’t mean that characters must always be likeable or sympathetic, or that only happy endings are allowed; I only mean that ‘Salem’s Lot was a bit of an exercise in revelling in the darkest side of humanity, and while there’s nothing wrong with that necessarily, I prefer it when it’s done with a bit more warmth. However, this was fortunately not true of every character. Ben Mears and his fellow impromptu vampire hunters are fully fleshed out – they’re flawed, human, and portrayed with the kind of warmth I tend to prefer. My main source of annoyance with ‘Salem’s Lot were the occasional rants against “rational” men and women who refuse to see the truth because they blindly worship science. I hesitate to say this because in some ways I liked that the novel acknowledged and addressed the character’s difficulties in accepting a supernatural explanation for what’s happening. This makes perfect sense in a 1970’s setting, and I know I would have been equally annoyed if everyone have been like, “Vampires? Oh, okay.” Still, I wasn’t completely happy with how their objections were framed because there were too many echoes of the anti-science feeling I see all the time in the real world – it’s easy to see their points extending beyond this fictional scenario. But of course, how others readers react to this will likely depend on their particular pet peeves and general worldview. Pet peeve aside, ‘Salem’s Lot was a hugely enjoyable read. I loved the Maine setting; the descriptions of autumn and of the coming darkness of the winter months; the way the sense of menace slowly builds up; King’s obvious joy in telling his story and the way it kept me up into the small hours of the night. Unbelievably enough this was my first King novel, but I know I’ll be reading him again. My next will probably be The Stand, but if you have any other suggestions I would love to hear them. They read it too: Boarding in my Forties, somewhere i have never travelled, Reading Rants! On an unrelated note, I wanted to help spread the word about one of my favourite bloggy events of the year: Persephone Secret Santa is back, and this year it’s very fittingly hosted by the two unofficial Persephone Ambassadors of the blogging world, Verity and Claire. My circumstances this year will require me to have a very frugal Christmas, but as I had an absolutely wonderful experience the past two years I still wanted to encourage you all to join. Don’t worry if you’ve never read a Persephone before – could there be a better excuse to start than this? 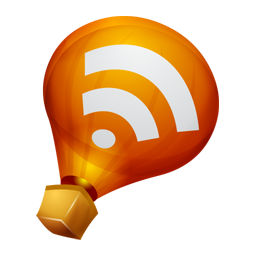 Please head over to Claire or Verity’s blog for all the details and sign up information. Hey Ana! It's been a while since I've read King. As most avid readers, I went through a "SK Stage" and due to that over saturation, burned myself out. I have to admit though, there are still a couple of his books that interest me. Salem's Lot being one of them. Usually i want to be snide about an author as prolific as King, but it's amazing how his novels are well-thought out and not formulaic. The man is good. He is, isn't he? I think it was Teresa from Shelf Love who said she can see him being perceived as a 20th century Wilkie Collins fifty years down the road, and I can certainly see her point. He's often dismissed as a trashy writer with no staying power, and yet forty years later his earlier books are still widely read. I haven't read any King, but I seemed to have watched a lot of the films based on his books and it seems to be a common theme to be horrid to his characters! LOL. I love the sound of this. The setting in Maine sounds gorgeous. I do own a lot of King's books and hope to read Under The Dome soon. Naida at The Bookworm is the biggest Stephen King fan I know. Interesting response because (and though I have not read the book) from your comments I would have thought the remarks about the rational people were meant to be ironic or sarcastic, suggesting the inverse of what he was actually saying. ...so that it would have actually been a pro-science scenario. But maybe that would be projecting my own prejudices onto it? Vivienne: Debi is a big fan as well, so I really think I'll continue to enjoy his work! Jill: I've been known to misread things before, but that wasn't what the tone suggested to me here (but then again, I also have my prejudices!). Anyway, this is really a minor point about an otherwise very enjoyable book. I used to be pretty snobby about reading King books, but then I read Dolores Claiborne and a few of his essays and discovered that there really is much to admire. I didn't give him a fair shake because of his writing in the popular horror genre. I'm currently working my way through The Dark Tower series and have The Stand waiting for me. I also plan on reading Salem's Lot at some point too. Thanks for the wonderful thoughts on this one! 'Salem's Lot is quite possibly my favourite King novel. It terrified me as a kid, and I still find it terrifying, as much for the darkness of the people as for the actual horror elements. I'd love to get my hands on that copy to see what King has to say about it, since I've never read anything *about* the book. It's interesting that he wanted to take Stoker's optimism and turn it on its head - though the early 70s in America would have been the perfect cultural moment for that. I feel silly saying this, but I have never read King, even though he is a great favorite of my good friend Sandy! I did read the first segment in The Stand graphic novel series, and want to continue onwards with that, in addition to reading some of his other work. This sounds like it might be an interesting choice for Halloween, which I have just started to think about. I liked your reactions to it. They were very realistic and intellectual. Thanks for sharing, Ana! Yes, I am a disciple of Uncle Stevie, my following that began in middle school and stretches until the present. I read Salem's Lot in high school, so I don't remember much, but nobody does small towns like Stevie, and nobody spins a yard quite like him. My son is reading this now. Ooooh. Its been so many years since I read King, but I loved Salem's Lot a lot. 'IT' is also good ( though I had a few problems with one particular scene, and also with the ending) very creepy and chewy. If you're going to read The STand ( which I recall loving) I've ben advised not to read the unabridged or 'authors preferred' version. Apparently the characters come over as horribly unsympathetic in it - I wonder if it has to do with something like you describe for Kings original intention for 'Salems'? Did the 'preferred' version reflect a darker approach that King wanted all along?) This is going to sound mad, but early Stephen King always reminded me of (a flowerier)Steinbeck. Also, its been a while since I read them, but I recall his short fictions The Body and (most especially) The Long Walk as being well worth the read :) Would love to hear what you think of them! I'm seeing a lot of people reading King's work lately - I guess because Halloween is coming up. I'm afraid it would be too scary for me. I don't think I've ever read anything by King... I don't like scary stories these days, they give me nightmares for weeks. 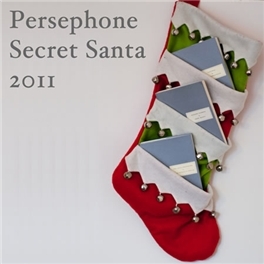 :-( The Persephone event sounds like fun, I can't believe it's secret santa time again!!! Oh, it is definitely the Halloween season! I just finished 'Salem's Lot early this morning and loved, loved, LOVED it. 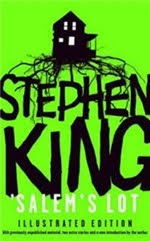 I felt the same about King's ability to draw out the small town environment, and for me, it was exactly what I hoped a Stephen King novel would be, especially since I refused to read him after I only read one short story of his back in the early '90s and found it to be boring. I read The Colorado Kid last week and found the ending to be just okay, but man oh man - I couldn't put 'Salem's Lot down. I did get creeped out in many sections, and it made me think of what it would be like to read this when it first came out. Creepy, creepy! And oh, I felt such sadness for Father Callahan. Carrie and Christine were the one I remember being creeped out by the most. I read Duma Key a few years back too. Enjoyed it but the scary factor wasn't as I high for me. Not sure if it's because I'm slightly hard to scare or if wasn't meant to scare so much as make you look over your shoulder. I also remember liking The Long Walk. I think he wrote that one under another name though. I used to love Stephen King, though it's been a long time since I read any of his books. I remember my favourites were Misery and The Shining. I also enjoyed The Eyes of the Dragon, which was a fantasy novel he wrote for his daughter. I think you might like that one, though it's very different from his other books. Wow, it's been a long while that I read a SK book. I think one of the most unforgettable reads I read thus far is "Carrie" - watched the film too. I also enjoyed watching "The Shining"... loved the creepy atmosphere!! I was a huge Stephen King fan in college and remember Salem's Lot as a favorite... thanks for bringing back the memories. I'm so glad you liked this! It's not among my absolute favorite King novels, but I like it a lot. Definitely one of my favorite vampire stories. And yes, that was me who made the Wilkie Collins comparison. Contra Celine's advice regarding The Stand, I've always been told that the unabridged version is better. It's the version I read, and I loved it. I didn't find the characters particularly unsympathetic, although they did get more complex as the book went on. I think Jenny has read both versions, so she could advise. This is one of my all-time favorite books. I feel that you are exactly right -- it's as much a small-town story (and a horror story at that) as it is a vampire story. He captures the 'small evils' so well. Yaaay to liking Salem's Lot! I read it years ago - I've read almost everything he's written over the years. I've slowly begun rereading some of the earlier ones. The Stand is coming soon for a reread. My favourite novel by him is The Shining. I still cannot read some scenes in the book when I am alone. The Shining is one of my top 10 horror novels of all time, it's that good! Salem's Lot is also very good, though now that you have pointed out how he paints his characters with broad strokes and is mean to them, I can see this was a problem I remember too. He's gotten much better at making characters individual even as they represent a type - it was one of the superb things about Under the Dome, which I read in August. I'm so delighted you are reading and enjoying him, Ana!! It's good to have you back!! I missed you! Great timing! I was looking into which book I could give at All Hallow's Read as part of Neil Gaiman's new tradition, and was wondering about Salem's Lot, which he recommended. I now see from your review it is exactly the kind of book I was looking for to give. So thanks! Do you know, I don't think I've actually read anything by Stephen King, although I've seen some of the films (which I find frightening). It's probably because they are normally classed as horrors, but I've recently discovered I don't scare that easily so I may give him a try soon! I've never read anything by King, probably because I've seen him too often in the movie-better-than-book lists. "Cultural saturation with vampires" I hear ya! I call it my "vampire fatigue", so I don't think I'll start my King experience with this one, even though I love small-town novels. I'm more tempted by Shawshank's Redemption - have you read that one? I haven't read this in so long that I can't even remember if I liked it or not! What a very interesting review. I must admit I'm one of those who thinks he is trashy and had to realize that I've only read Carrie which I didn't find trashy at all and I enjoyed his book on writing a lot. I should definitely be more careful when judging an author I don't really know. At any rate, I am currently reading this book and it is a great read. I also had the new introduction in my copy and I loved how he wrote about how his mother called all of the books he read as a kid "trash" (jokingly) and how she would probably have found Salem's Lot to be "trash" too! But this guy can write and his stuff isn't trash at all. Definitely read The Stand next! I finally got to reading Stephen King this year, starting with The Girl Who Loved Tom Gordon in the spring. Then a couple of weeks ago I read Bag of Bones which seems to share a theme with Salem's Lot - that of a town and its secrets. My nan and dad are huuuuuuge Stephen King fans! My dad eventually persuaded me to read his dark-fantasy epic The Dark Tower, and I'm so glad I did. There are seven insaltments of it so plenty to keep you going! Now I've decided to try more of his work, starting with Thinner which he wrote as Richard Bachman. I read this in college, and -- happily -- I wasn't too old to find it creepy! I still say I love King although I haven't read him in ages (another one who went through a lot of his books young then burnt out before getting to some of the real classics). It's the small town detailing that I like so much about his writing, the way he takes time to create a real place full of people whose lives are full if a bit mundane before destroying all that normality. It's really interesting what you say about King's use of rationality to obscure a real paranormal explanation of events and his characters cries against others disbelief. In Dracula I believe its the scientific character Van Helsing who eventually brings the group to realise vampires are harming Lucy, but another scientific character (Seward) would dispute the idea of vampires. I wonder if King was trying to say anything about those two characters when he wrote Salem's Lot. I recommend Needful Things and maybe IT (I've never made it through, because it creeps me totally out, but the first 150 so pages were fab). I remember enjoying this book. I really need to read it again. I enjoyed your review of Salem's Lot, one of my favorite King stories. You talked about reading more of his stories, have you read 11/22/63? I'd highly recommend it, I've done a short review of it on my blog.